Facebook informed me that the Church is stepping away from some of the pageants that Church members and their friends have attended over the past decades. According to the Deseret News, 2020 will be the last year the Hill Cumorah Pageant will be held with direct support from the Church. The Mormon Miracle Pageant in Manti will no longer benefit from direct Church support after 2019. On the other hand, the two pageants that are held in Nauvoo will continue. 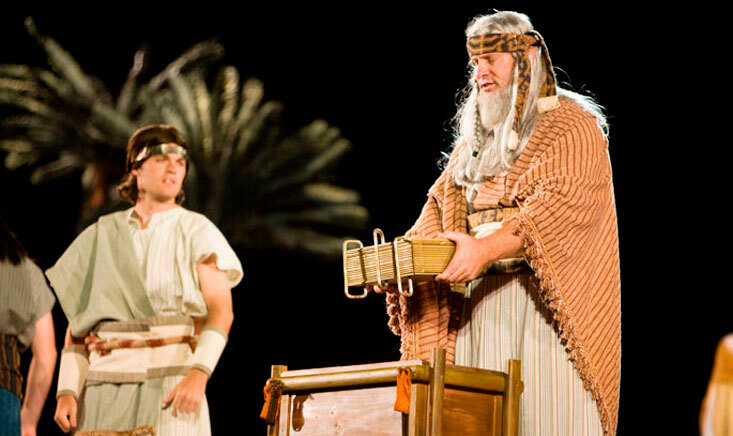 I haven’t attended the Hill Cumorah pageant in decades. I hear in the past few years attendance has dwindled. Apparently the local mission decided this summer it was no longer appropriate for full-time missionaries to attend the pageant, attendance which involved long miles of travel and very late nights (even when missionaries ostensibly were accompanying those seeking to learn more about the Church). I haven’t attended the Manti pageant. I’m not sure what I’ve heard about that pageant is accurate, or if what I remember of comments is actually what people told me. I am happy to hear the Nauvoo pageants will continue. These pageants were written recently, reflecting history that is relatively accurate. This news is interesting in light of what I did yesterday. I and several family members traveled 7-8 hours each way and spent $45 apiece to spend the day at Hart Square Village, a privately assembled collection of over 100 pioneer structures. Hundreds of docents and artisans assemble on the fourth Saturday of October each year to explain and recreate quotidian activities of 1800s life. We shucked corn, sampled sweet sorghum, sang hymns in the log chapel next to the lake, and watched as re-enactors fought a Civil War-era skirmish (in this North Carolina setting, the Confederate soldiers won the day). It is not that crowds won’t assemble for such gatherings, but the zeitgeist of our age is not the same as the 1937 sensibility that gave birth to the original Hill Cumorah pageant. An era is coming to a close. But for me and my household, we look forward to the future and the new opportunities that wait in store. I’ve seen all of them. They are nice. However, I think we spend a lot of money to entertain Mormon tourists. I get more spiritual value out of attending the temple. I get more out of visiting the Sacred Grove near Palmyra, or walking down Parley Street in Nauvoo. The permanent facilities built for the Cumorah pageant are impressive contrasted to the rented bathroom trailers used for the Manti pageant. However maintenance of costumes, scenery and sound equipment could be a considerable expense. It is possible that private entities will volunteer to sponsor the event in coordination with the local church units. The cultural celebrations that have become a regular feature of temple dedications may also be cut back or eliminated. There was a youth fireside associated with the dedication of the Concepcion, Chile Temple at which President Nelson presided today, but no mention of a cultural celebration. Having been part of similar celebrations in the past I understand the expense of both time and effort required. There may also be a motivation to avoid the contention that occurs with groups who attend such events in order to disparage The Church. At every pageant I attended there were many eager to hand out scurrilous material. The various pageants have been free to all comers with no real possibility of applying security measures as are found at events in the Conference Center. I attended a pioneer day concert at that facility and all the seats were by standby or reservation and attendees had to pass through security checkpoints, a sad necessity in this contentious age. On the other hand, as impressive as the Pageant at Cumorah could be, I found more meaning visiting the area one fine spring day when there were few people around to disturb the peace of the Sacred Grove. As for the Manti Pageant, a visit to the Manti temple with its murals by Minerva Teichert was both a cultural and spiritual feast that far exceeded the satisfaction of the crowded pageant. Next thing you know they will announce an end to church sponsored basketball, but that may be a step too far. I attended the Manti pageant once as a teenager. The only memory that really stands out is the one of the anti-Mormons if you want to call them that, waiting outside to try and engage us in a debate. I had never really came across any anti-Mormons at the time, I think I was only 12 or 13 years old, and it was stressful situation to say the least. I for one wouldn’t mind if the pageants were to go away, I think we could find better uses of our time and energy. Sometimes there are other dynamics going on. For instance, the missionary department in SLC controls most aspects of Visitors’ Centers. When you visit and watch a video, for example, it is streaming from SLC. Because of this centralization, there is a preference to keep things standardized and simple. The DC Visitor Center had extensive A/V infrastructure that had been donated – I think the original cost was ~$40,000. Since the auditorium is primarily used for live performances, this A/V equipment was a significant benefit. But when anything failed to work, the missionaries would call SLC, and SLC had not involvement in the A/V equipment. So when a recent renovation occurred, the A/V equipment was removed. An attempt to put in additional jacks (in case performers brought their own A/V equipment) was discovered and it was directed that these be removed as well. In a way this is cleaner – if people want A/V equipment beyond the concise infrastructure now installed, they can bring what they need (and take it away when they’re done). However there are groups that enjoyed access to the prior extensive A/V infrastructure who don’t have their own portable A/V equipment. So for these individuals, the loss of the A/V infrastructure has been frustrating. As to vocal critics, these also tend to hang out around temple open houses. It isn’t as though we’re going to cease building temples. When the critics are half-way reasonable, I enjoy the discussions (they are usually uninformed about the actual identities of the individuals of whom they are speaking). But there are times when the critics are not reasonable, and I don’t like getting screamed at (did that last critic have a bullhorn and a live-broadcast camera – I think he did). Streamlining seems to be the direction in which we are moving now and with that in mind, I wonder if the pageants were probably one of the bigger targets for streamlining. Could that fact that Maya-inspired costumes and current and increasing cultural sensitivities (with regard to race-representation in performances) could make this yet another target of animosity against our church? And then I see online who is most upset at it: people who 1) are never satisfied with what the Church does anyway, 2) have attacked the pageants as simplistic and sentimental in the past, and 3) are often out of the church or on their way out – those are the people most upset and crying foul and screaming about how the arts must be supported, etc. So, it seems to be upsetting all the right people the most. I see others who are upset, but not to the degree that they post long winded rants about how the Church has, once again, failed to live up to their progressive ideals. Wasn’t there a Martin Harris pagaent down in Utah? I remember being invited to go but they discouraged children attending so we couldn’t go. This was about 2007. We lived in nearby Rochester for 14 years and attended and provided services for the Hill Cumorah Pageant every year. During the first few years, the Pageant was well attended, but the lighting, sound, parking and seating facilities were deficient at best. Variable weather also proved to be an occasional detriment, especially rain. I always invited many of my non-LDS friends at work to attend the Pageant. Many of them later reported to me that the show was striking, but they did not understand our message. The theme and messages of the Pageant were often incoherent and intelligible only to the Mormons in attendance. I reported these negative criticisms to the Stake President. He took action and formed a committee to find ways to improve how the story would be told and invested Church money to improve the AV systems. The resulting new Pageant was a great improvement in terms of message transmittal, but required so much volunteer work, especially by the Missionaries and youth, it became an annual burden for many from nearby Wards and Branches. Added to that problem were the constant efforts of the enemies of the Church to appear every year near the parking lots and hand out brochures and yell insults at attendees. Very disturbing for Church members. At work, we created an addendum to Murphy’s law about large-scale outdoor pageants that we dubbed Murphy’s AV Fail Law: “If anything can go wrong with an AV system, it will, and everything you may try do to fix the problem quickly will only make it worse.” We saw many AV fails at the Pageant. AV fails were another detriment that made the event distressing to the staff and volunteers. In conclusion, I agree that Pageants are no longer effective ways to reach non-members. They are far too expensive, time-consuming for volunteers, and are still somewhat incoherent in terms of messages being transmitted to audiences. I rejoice in the flexibility and courage our leadership has demonstrated in this as well as other recent changes to ‘tradition’. Yet the basic doctrine is stable. We still teach our children the Articles of Faith as a reliable if incomplete guide to doctrine. We trust members to follow the Spirit has they read the same scriptures Joseph Smith revealed (with very minor edits of grammar). As an active patron/worker in temples for nearly 60 years I can attest that while procedures have evolved (even now minor procedural matters vary from temple to temple and even shift to shift) the doctrinal core is remarkably stable. Remember when a Church stake building could be identified by the presence of a satellite disk? They were evidence of an organization that continues to stay current with technology. This is the fruit of being led by living prophets. I grew up in Mesa Arizona right down the street from the temple — close enough to hear the audio every night of the Easter Pageant. Going to the pageant every year was something we always looked forward to — and at least for the Phoenix metro area, was a great source of missionary referrals for the year — near 50%. Sure, there were anti-Mormon protestors, but they were mostly ignored. I am sad to see the Hill Cumorah Pageant going away and the hokey Manti Pageant staying. I went once in college and never went again it was so bad. My brother and cousins have all been in the Hill Cumorah Pageant. It was fun going out to Palmyra to see them. I’m very happy that the Easter Pageant in Mesa is not impacted. It’s a wonderful event that my family attends every year and is one of the primary ways that my children understand what Easter is all about. I suspect that aging infrastructure and the remote location of Palmyra were factors in the decision to end the long run of the Cumorah Pageant. The Sacred Grove, the Grandin Printing Office, the Martin Harris farm, the recreated Smith farmhouse and the nearby temple are enough to attract members to the area. The recently established Aaronic Priesthood site is also within easy travel. We enjoyed attending the Pageant and really liked the improvements in the script and sound effects, but it called for a tremendous expenditure of time and effort even if the costs of replacement of aging facilities are not considered. Without the crowds attracted by the Pageant the truly holy experience of visiting the Sacred Grove will be enhanced. We recently visited the Liberty Jail and I was grateful for the relative solitude of our experience. 1. The Mesa pageant will still happen, for now. It’s a local pageant, the cast and crew are, for the most part, local, and the vast majority of the audience tend to be local. It also gets lots of missionary referrals. 2. The Hill Cumorah pageant, on the other hand, is often staffed and attended by members from outside the region. Rich (or at least well off enough to be able to afford the time away from work and the extra expense of living away from home) members take vacations to be in the pageant and a large percentage of the audience are basically member tourists. 3. So, if the Church wants to focus on building up local activities, it would make sense to keep the Mesa pageant but not the Hill Cumorah one.